Bengaluru:“Thank u all for your genuine blessings, support & faith in me. 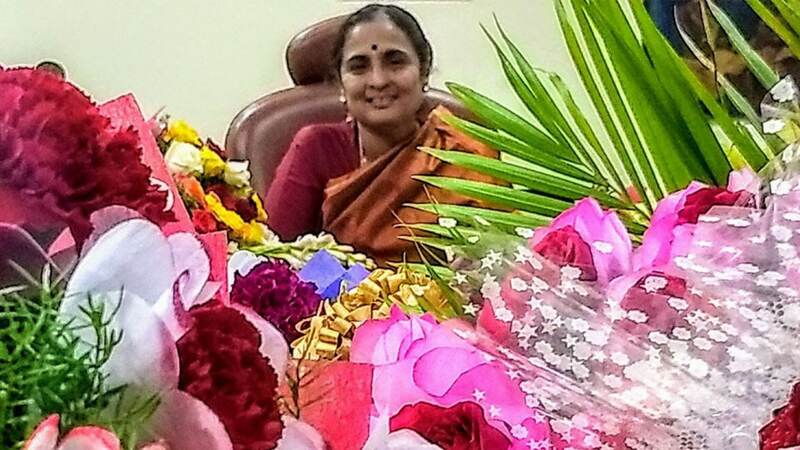 Will never let u down.” This is how the newly-appointed Chief Secretary N. Ratna Prabha tweeted before she took charge. Her popularity is so high that in the last five days more than 5,000 people have visited Vidhana Soudha to greet her. After she took charge on Dec. 1, on the first day itself, more than 1,500 people from all over the State came to wish her. Most of them were politicians and officials. As a result, her office was flooded with bouquets. Along with this, she had received more than 300 different kinds of complaints. Dec. 2 was Eid Milad and Dec. 3 was a Sunday. From Dec.4 to Dec.7 till evening 6.30 pm there was a huge flow of visitors to meet Chief Secretary Ratna Prabha. Even though the Chief Secretary’s Office is right next to the Chief Minister’s chamber in Vidhana Soudha, there were not many visitors seen all these days. However, this is the first time that visitors have lined up from morning till evening in front of the Chief Secretary’s chambers. Sea of people: Marigowda, a peon in the Chief Secretary’s Office since 1980 recalled that he had not seen such a sea of people in front of the CS Office in his 37 years of service.